Of “The Festival of Hate and Bad Tidings” & why Love Stinks! How Ivy Hope wishes it was the “The Festival of Hate and Bad Tidings” that will take place in the village of Little Puddington this year and not the perfectly nauseating “Festival of Love and Sweet Tidings”. Not that Ivy has ever actually attended The Festival of Love and Sweet Tidings for the very idea of it makes her want to sit in a dark place, howl and rip teddy bears apart. Every year they come, red-sweatered drones flocking together to line the streets, canoodling over drinking chocolate and fouling the peace with the lip smacks of their sugary kisses. But this year, Ivy cannot escape The Festival of Love and Sweet Tidings for Benjamin Briarley, otherwise known as the village idiot/poet, has decided to announce his love for her. Worse still, he means to do this publicly by reading out the nauseating poems he’s written about her on the “Words of Love” festival stage. In order to avoid a lifetime of public humiliation, Ivy must stop him. Which is where her best friend Victoria comes in, with a wild idea for an anti-love potion. Now Ivy Hope must secure the help of a prickly old witch, enter the creepiest graveyard ever and battle supernatural guardians in an effort to stop the buffoon Benjamin Briarley ruining her life forever. Love is vile, love is weakness. Love destroys everything. 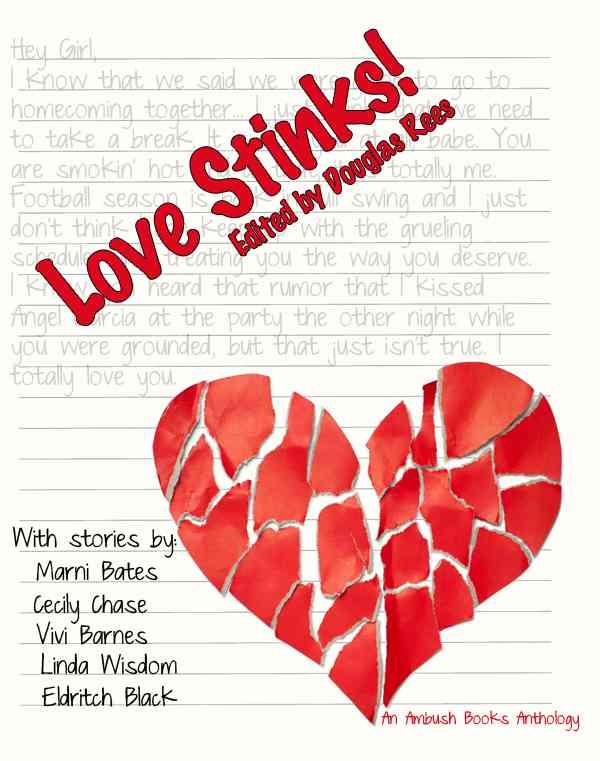 I was absolutely thrilled to have my story accepted for the anthology Love Stinks! LOVE STINKS! is the second anthology from tween/teen publisher Ambush Books. Featuring stories by Vivi Barnes (Olivia Twisted), Marni Bates (Awkward), Eldritch Black (Book of Kindly Deaths), Karice Bolton (the Witch Avenue and Watchers series), Naomi Canale, Cecily Chase (aka Cecily White…Prophecy Girl), Rachel Clarke, Shanyn Day, Tara Gonzalez, Laurie McLean, Doug Rees (Vampire High), Lynda K. Scott (Great Escapes B&B), Linda Wisdom (A Demon Does It Better) and Carol Wolf, (Summoning), LOVE STINKS! will take you on a roller coaster of red hot goodness that will make you laugh, cry and everything in between. To buy a copy of Love Stinks! Click Here! Filed Under: Books Tagged With: Love Stinks!